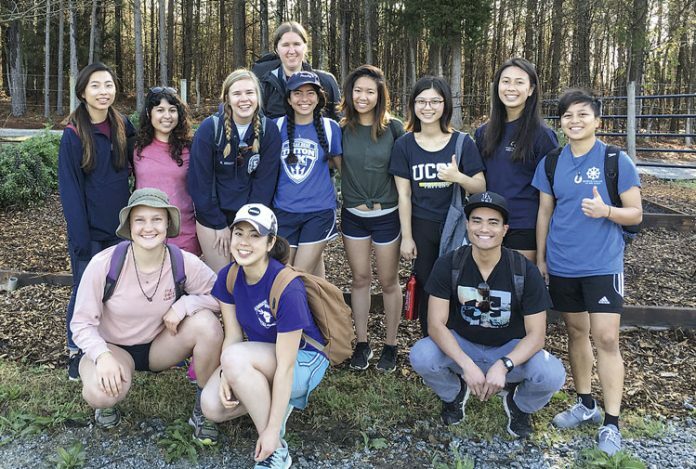 A group of students from the University of California at San Diego recently raised money to work at the 180-degree Farm in east Coweta County. Pictured, in front from left, Maddy Luthard, Seira Tanaka, Jacob Lim; middle from left, Jenny Huang, Sabrina Esqueda, Liz Delaney, Meeta Marathe, Jenny Zhan, Peixi Chen, Regina Wong, Hanna Banta; and, in rear, Nicoletta Skaggs. Photo/Ben Nelms. 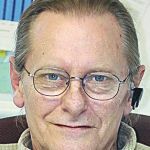 The variety of products produced at the nonprofit 180-degree Farm in Sharpsburg continues to increase, as does the number of college-aged volunteers who raise funds to travel on their school breaks to work and gain knowledge and experience. Such was the case when a group of students from the University of California at San Diego could be found working the fields in March. “They raised the funds to fly here and work. It’s remarkable,” said farm co-founder Scott Tyson of the 12 UCSD students. “Seira and I fell in love with the work they’re doing,” said Maddy Luthard who, along with Seira Tanaka served as service leaders, worked since June 2016 and recruited team members for the spring break trip to the east Coweta County farm. Significant to the travel to Sharpsburg was the students’ concern for food justice – the belief that everyone should have equal access to nutritious food, Luthard explained. Sitting around the large wooden table during lunch on March 29, several of the students said they had been stuck in the “college bubble.” Traveling to Nicole and Scott Tyson’s nonprofit farm for an alternative spring break program helped them focus on other issues, they said. With smiles on their faces and putting in serious work time at the farm, it was clear that the students’ aim to serve as active volunteers was impossible to miss. Scott Tyson said four colleges and universities visit the farm each year, providing students with hands-on learning experience. Students from Central Michigan University visited in December, followed by groups from the University of Florida and Michigan State University. Founded by Scott and Nicole in 2009, the nonprofit 180-degree Farm off Ga. Highway 154 continues to supply healthy, farm-fresh food through its affiliation as a Community Supported Agriculture (CSA) participant and currently has a waiting list for that program. But there’s more. The farm began, and continues today, to focus much its efforts on cancer patients and their families. Yet the greater community also benefits from the all-volunteer work that goes on year-round. In 2016 alone, the farm gave away more than 30,000 pounds of food to local food banks, hospitals and churches. The farm sells chicken, duck and goose eggs to the public, with lamb expected to be available in mid-May. Scott said other offerings such as beets, spinach and honey should be available soon. Nicole and Scott have aded another field along with more pervious parking and are currently building a citrus greenhouse that they hope to open next year. Scott and Nicole over the years, and today, have held various classes in the Coweta and Fayette communities. Cooking classes are expected to begin in the near future while Scott recently spoke to students at McIntosh High School in Peachtree City. “And 25 of them have come to volunteer at the farm,” Scott said.